SM ZeroStat Shippers eliminates lead damage when shipping or handling components with fragile leads. Leads are suspended while shipping. A squeeze feature allows the part to be removed from packaging without being touched by operator's hands. 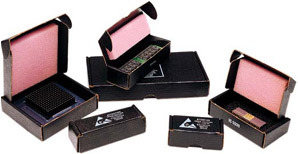 Electronic components that are sensitive to static are protected by Ground Zero's static shielding ZeroStat shipper. 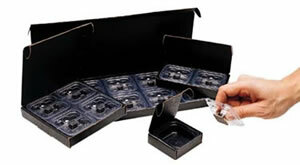 The thermoformed insert, foam and adhesive are static dissipative to prevent any charge from being generated. 1) Dissipative adhesive allows part to be picked up without touching operator's hands. 2) Handle & ship component safely in dissipative insert. 3) Squeeze dissipative plastic insert to release component. 2-3/4 x 2-3/4 x 15/16"
5-3/4 x 2-3/4 x 15/16"
5-3/4 x 5-3/4 x 15/16"
14-3/4 x 5-3/4 x 15/16"
5-3/4 x 6-1/4 x 2-1/2"
7 x 5 x 1-1/2"
7 x 5 x 2-1/2"
8 x 8 x 1-1/2"
9 x 7-1/2 x 1-1/2"
9 x 7-1/2 x 2-1/2"
9-1/8 x 14-3/4 x 1-1/2"
9 x 14 x 2-1/2"
10 x 10 x 4-1/4"
10-1/2 x 8-1/2 x 2-1/2"
11 x 7-3/4 x 2-7/8"
12-1/2 x 10-1/2 x 1-1/2"
12-1/2 x 10-1/2 x 2-1/2"
13-1/2 x 13-1/2 x 2"
14-7/8 x 6-5/8 x 2"
15-1/2 x 12-1/2 x 1-1/2"
15-1/2 x 12-1/2 x 2-1/2"
18 x 12 x 3-1/2"
18-7/8 x 17-5/8 x 1-3/4"
20 x 19 x 2"
20-1/2 x 15-1/2 x 1-1/2"
20-1/2 x 15-1/2 x 2-1/2"
23 x 16-1/2 x 5"
24 x 21 x 5-1/2"
17-1/4 x 10-1/2 x 5-3/4"
16-1/2 x 10-1/2 x 6-1/2"
26-3/4 x 6-1/4 x 6"
19-1/4 x 16-3/4 x 5-5/8"
21-1/4 x 12-1/2 x 4-1/2"
20-1/4 x 17-3/4 x 5-1/8"
ZeroStat Shippers are static shielding shippers for sensitive electronic components. ZeroStat Shippers eliminate the need for static shielding bags. Conductive crosslink foam on the bottom provides for insertion of leads to hold the component in place during transport. Antistatic cushioning foam is adhered to the top. Ground Zero can custom fit the interior with a static protective thermoformed insert to exactly fit your component or component kit. Add 'M' to the part numbers below to order mailer only shipped KD, with no foam. 2-1/2 X 1-1/4 X 1"
3-1/2 X 1-1/4 X 1"
4-1/2 X 1-1/2 X 1"
3-7/16 X 2-1/8 X 15/16"
3-3/4 X 3-3/4 X 1"
7 X 3-1/2 X 1"